Hello lovelies, so I very luckily have a friend who is a masseuse who asked if I fancied reviewing one of her new massaging techniques, I obviously jumped at the chance who wouldn't? Bearing in mind I'd previously paid for a massage from Natasha and left feeling so relaxed so I couldn't wait to see what this bamboo massage was all about, really curious. 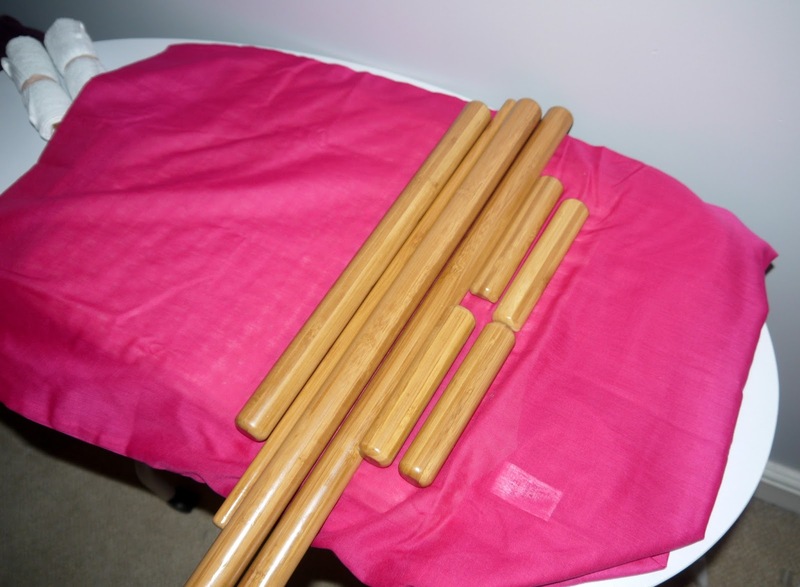 Bamboo fusion is a new relaxing form of massage that combines the techniques of Swedish massage and the benefits of soothing heat with the invigorating energy of bamboo and rattan. The bamboo is heated with an electric pad and used to literally roll and knead away the aches and pains of every day stress. 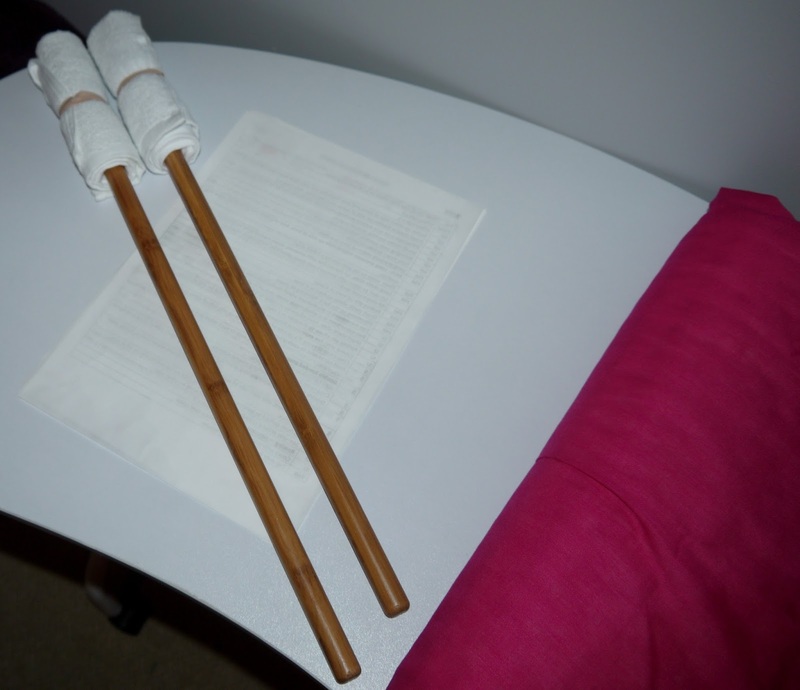 Each piece of bamboo or rattan is carefully hand crafted and shaped to glide smoothly over the body. It increases your circulation, flushes your body of metabolic wastes (lactic acid etc) for faster healing time and detoxification, It decreases muscle spasms, breaks up tissue adhesions, helps budge that cellulite and releases endorphins to promote relaxation and pain reduction and most importantly relieves stress! Natasha offered me the full body massage which is the back, back of the legs, feet, shoulders, front of legs, arms and back of the neck. I have never had anything like this in my whole life it was amazing! The heat of the bamboo kneading away at the pains on my back just felt un real and surprisingly the back of my legs, I walk a lot with the kids and it really did help out my calfs, my legs felt new the next day. 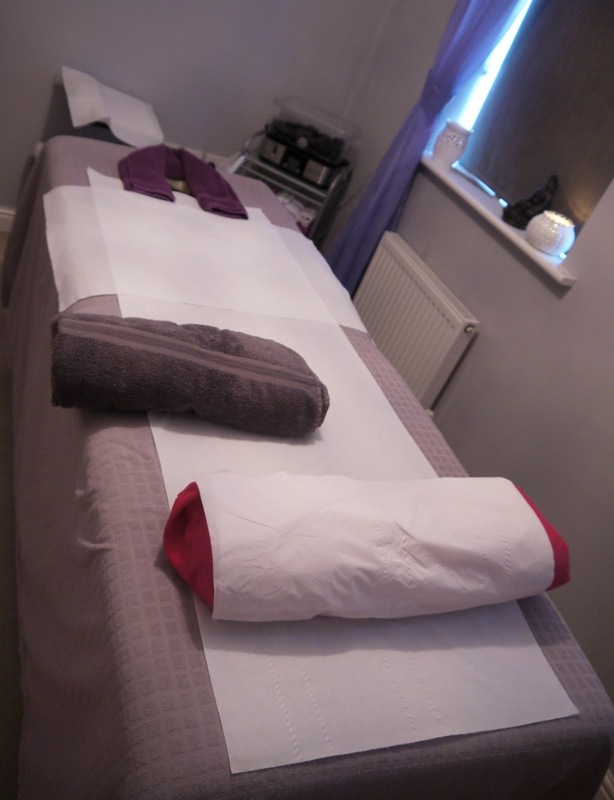 Natasha also has a heated matt under the massage bed so it was nice and toasty whilst getting pampered. For ladies wanting to get rid of cellulite this would help massively and great for a monthly treat as she is so affordable and great at what she does. 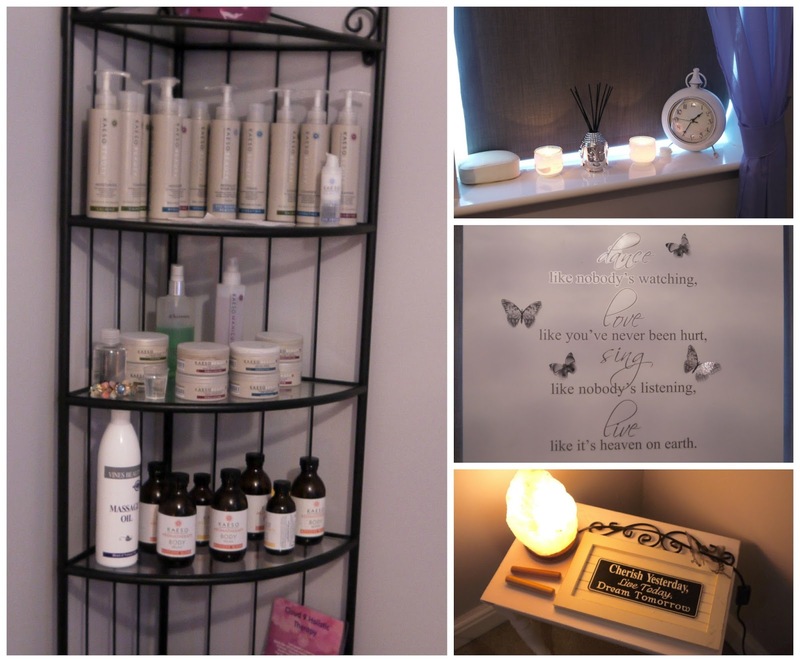 If you didn't fancy the full body massage though she offers just the back which is £15 for 25 minutes or Backs of your legs, shoulders, feet and the back is £20 for 50 minutes, so so affordable but you feel like your in an actual spa when you close your eyes and listen to the relaxing spa music she plays and the smell of the room. Natasha is very professional and brilliant at what she does but she's also a very down to earth lovely girl so if you did fancy a chat along with your massage she would be happy to oblige but I know you go for a massage to chill out and be pampered and you wouldn't even think you was in her home, she has decorated the place beautiful and serene, a really relaxed atmosphere and I never want a normal massage again after having this treatment. The back of the neck was a surprise for me, you don't think how much strain your neck goes through day to day and the warm bamboo stick rolling against it felt a million dollars I actually haven't got any stiff neck like I did prior to going in and my body feels all relaxed and like a weight has been lifted not literally sadly aha but all the tension has gone. 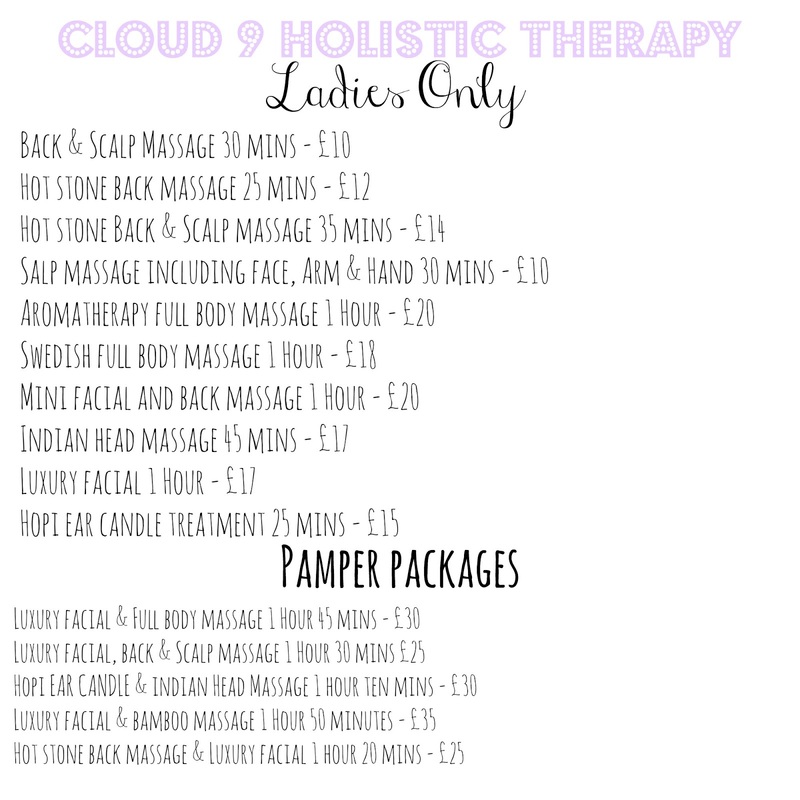 I couldn't recommend Cloud 9 Holistic Therapy to you and my friends and family enough, you won't find an amazing masseuse for the prices Natasha offers anywhere. 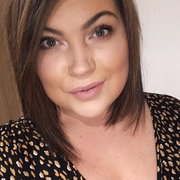 If you would like any more information about Natasha's services contact her on her Facebook page HERE, she has a website going on in the process.